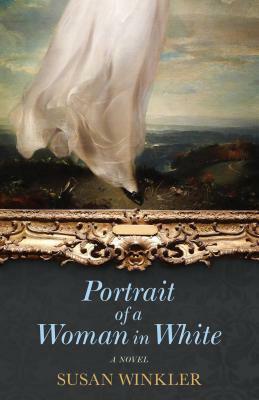 Portrait of a Woman in White by Susan Winkler is the story of a family of wealthy Jewish art collectors in Paris that begins before World War II. That’s all I need to say, and you can imagine the rest. You already know what tragedy will befall them even if they don’t. We know they will be forced to flee France, or worse, and that their art will be looted. But it’s what we don’t know that makes us keep turning the page. Who will survive and how? 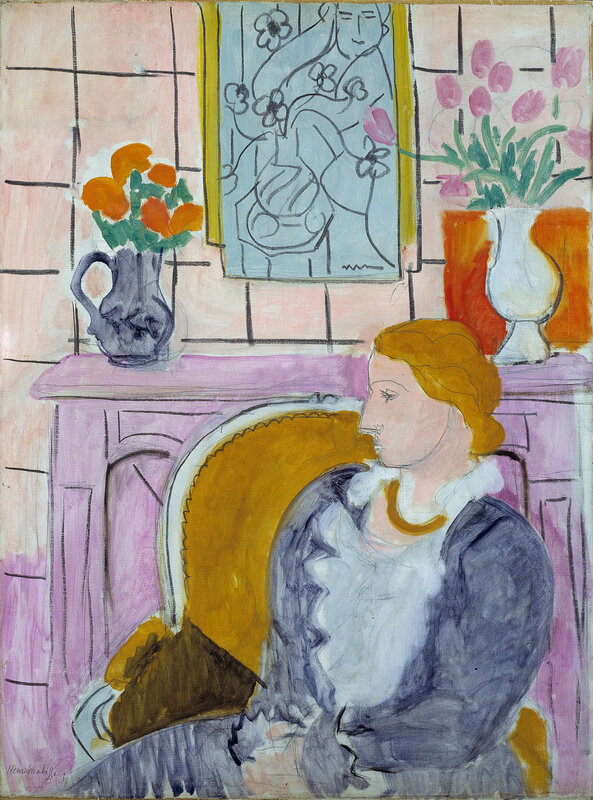 What becomes of the family’s most precious possession, a Matisse portrait of their mother? And finally, what will become of the young lovers who are separated at the border of France and Spain? By now most of us know about The Monuments Men, the story of how the Nazis systematically looted the art of Paris. 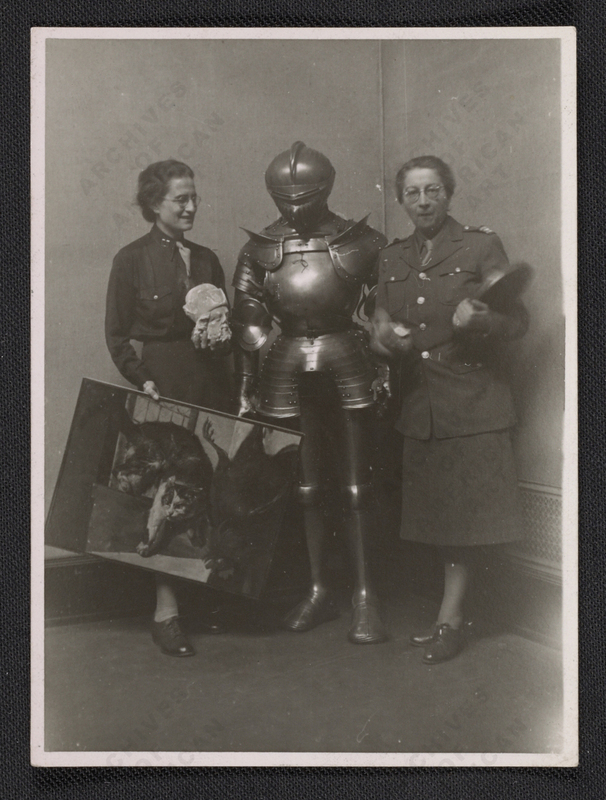 We’ve seen the images of Hermann Göring marching into the Jeu de Paume in Paris to claim more trophies for his art collection under the watchful eye of Rose Valland. But to hear the story from the point of view of one young woman, Lili Rosenswig, brings it all to life and makes the tragedy that more real. First, Lili witnesses her mother posing for Matisse in his studio on Boulevard Montparnasse in a lovely white satin gown. The portrait becomes a prized family possession, and hangs from the wall of the Rosenswig’s salon in a gilded wood frame. As the Rosenswigs prepare to flee France, they hide the Matisse at their relative’s country villa, planning to see it again soon. Instead, the family is betrayed and the portrait is seized by the Nazis along with most of their other valuables, and taken to the Jeu de Paume. The Jeu de Paume was a serene pavilion set in the northwest corner of the Tuileries Garden, opposite the Louvre, in the center of Paris. Napoleon had built it to house tennis courts, and its high white walls had served most recently as an impressionist museum. But when the Nazis arrived in Paris and began seizing private Jewish collections, the initial storage rooms in the nearby German embassy were soon filled to overflowing. Urgently, four hundred cases of work were moved to the Jeu de Paume, which then became the official repository and sorting center for all the art that the Nazis confiscated in France. Rose Valland is the lone French member who remained on the staff of the Jeu de Paume after the Germans requisitioned it, and managed to keep a secret record of all of the stolen art that came in and out of the museum. 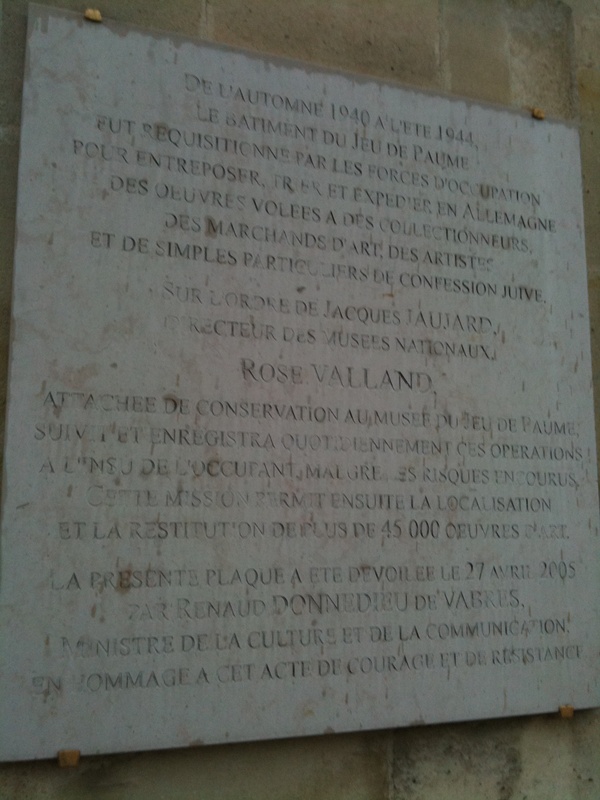 The plaque on the side of the Jeu de Paume commemorating Rose Valland’s heroism on behalf of French art. It explains that from the fall of 1940 until the summer of 1944, the building was requisitioned by occupying German forces storing art stolen from the French. Rose Valland took great risks to record the location of the stolen art, which resulted in the restitution of over 45,000 works. In Winkler’s book, Valland watches as Göring marches into the Jeu de Paume with his entourage of German officers and curators. The Matisse portrait catches Goring’s eye and leaves him breathless. Lili’s mother looks just like Göring’s deceased wife Carin. Göring claims the painting for his personal collection in his hunting estate near Berlin, named Carinhall after his first wife. The painting has its own journey, just as Lili Rosenswig and her family do. 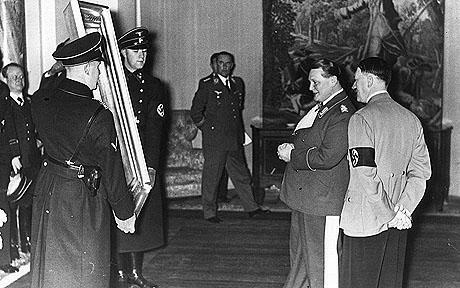 What became of the thousands of pieces artwork that Göring had installed in Carinhall by the war’s end? 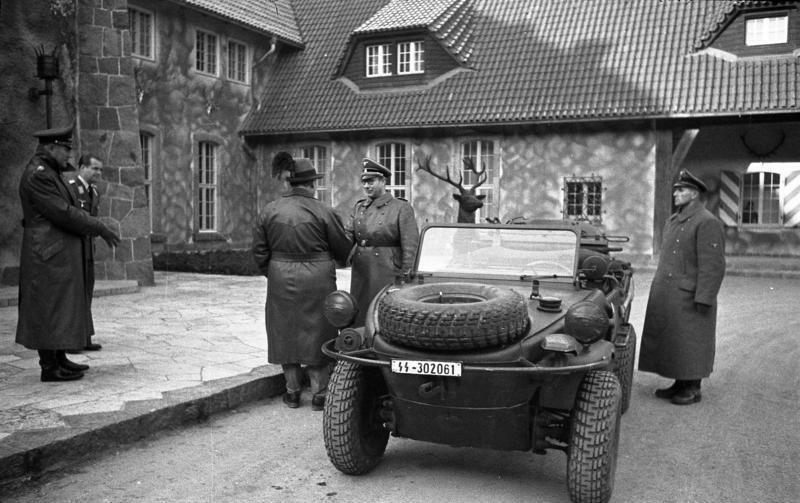 As bombs fell near Berlin, Göring was loading trucks and trains with his 1,375 paintings, 250 sculptures, 108 tapestries, 75 stained-glass windows and 175 objet’s d’art, sending them to secret locations in various mountain villages, including a mine shaft in Altausee, Austria and Bertchtesgaden in Bavaria. The story of A Woman in White is even more interesting because a very similar art mystery was just resolved earlier this year. A real-life Matisse painting called Woman in Blue in Front of a Fireplace was the property of Paris art dealer Paul Rosenberg, was looted by the Nazis and sold to an unscrupulous French art dealer. A Norwegian art collector bought it in 1950, unaware of its provenance, and proudly installed it in the Onie Onsted Art Museum near Oslo, Norway. In 2012, Rosenberg heirs asserted a claim against the museum, and in March, 2014, after its own investigation, the museum agreed to give the $20 million painting back to its original owners, in accordance with the 1998 Washington Conference Principles on Nazi-Confiscated Art, to which Norway is a signatory. To read more, click here. The road to reunite pre-war owners of Nazi looted art is long and complicated. And so it is for Lili and the Portrait of the Woman in White. Will Lili and her family every see their beloved painting again? 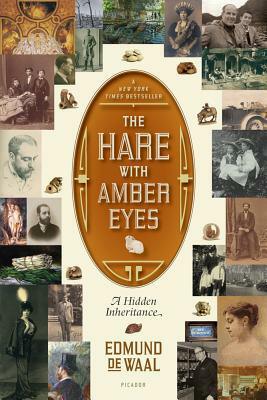 You’ll just have to read Susan Winkler’s book to find out. 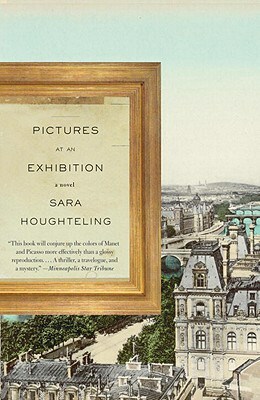 This entry was posted in Art and Artists, Art History, Art History France, Art History Site, Book Review, Paris Books, World War II France and tagged Jeu de Paume, Matisse, Nazi Looting, Portrait of a Woman in White, Susan Winkler, Woman in Blue in Front of a Fireplace by americangirlsartclubinparis. Bookmark the permalink.